Oh mighty Sun, this one is for you! 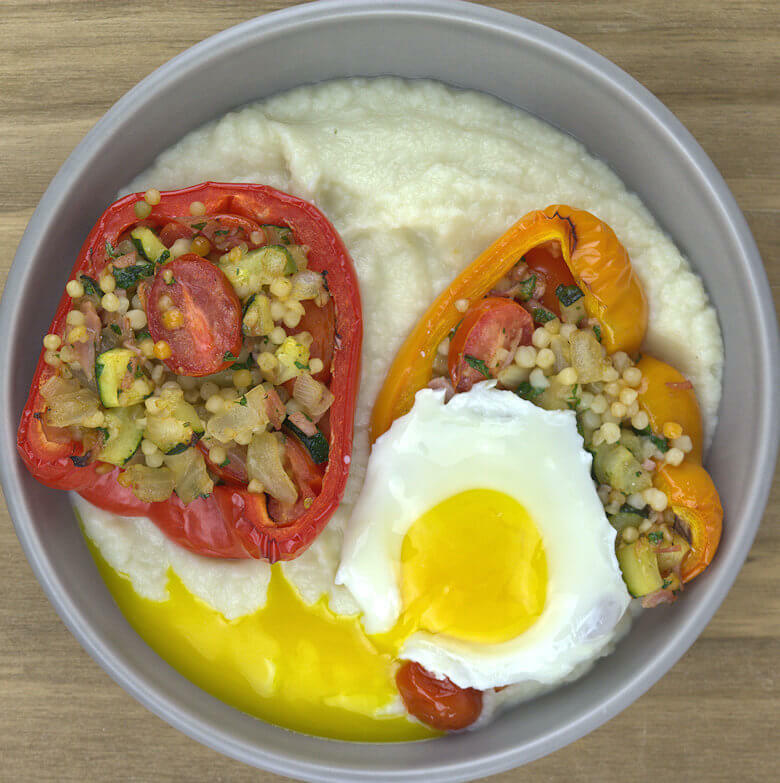 These bell peppers are stuffed with a flavorful mix of vegetables and couscous and topped with a fried egg, sunny side up. It is time to show your sunny face! Usually, stuff bell peppers with ground beef is part of my repertoire, but I was a little tired of that and decided to make a lighter version. These peppers contain a mix of cherry tomatoes, onion. zucchini, pearl couscous, parsley, garlic, cheese and cooked ham. Topped with a fried egg. 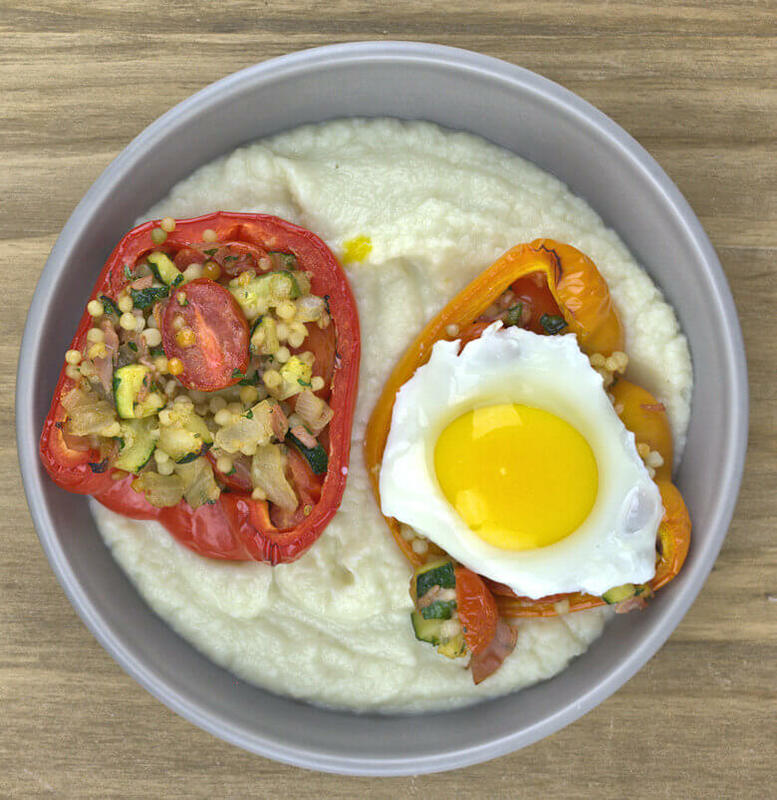 Served on a bed of cauliflower mash, but of course you can change that for pasta, mashed potatoes, grits, polenta, rice, farro. If you want to make this vegetarian, please omit the ham. The process of making these stuffed peppers is rather straight forward. Cut the peppers in half, lengthwise and discard the seeds and the white vein sections of the peppers. Place the halves on a baking dish, cut side up, and bake them in an oven to slightly soften them. Pick peppers that are firm and relatively large and pick different colors, even if it is just a meal for 2. I have a red and an orange pepper; they have roughly the same cooking time. Green peppers tend to take a little longer to become softer. Pick your color and cooking time to accommodate your preference. In the meantime cook the pearl couscous in vegetable or chicken stock and cook the onion, garlic, and courgette a few minutes in a skillet. Add the cherry tomatoes (halved), spices, and chopped cooked ham. Drain the couscous and add to the vegetables, together with parsley, spices, salt, pepper and some grated cheese. I would suggest to add a cheese with flavor. Something like a cheddar or a Gouda cheese, or pepper Jack or Parmesan. The cheese is not only added for flavor, but also to absorbs some of the liquid coming from the veggies. I am not a fan of Mozzarella in this recipe because it does not add flavor, and it doesn’t bind as well as the other cheeses. Fill the peppers with the vegetable mix and place back in the oven for another 5-10 minutes, so it is nice and hot to serve. Just before you take them out of the oven, fry your eggs, sunny side up. Preheat an over to 400 degrees F.
Cut the bell peppers in half, from top to bottom, and discard the seeds. Place the pepper halves on a baking sheet, cut side up and bake them for approx. 15 minutes. Cut the onion, zucchini (leave skin on) and ham in small cubes and cut the cherry tomatoes in half. In the meantime, cook the couscous according to the directions on the packaging. Once cook, drain couscous. Heat the olive oil in a skillet and add the onion, garlic and zucchini and cook over medium heat, until softened and slightly brown; approx. 5 minutes. Add the ham, cherry tomatoes and cook for 1-2 minutes, until well-combined. Add cumin, coriander, salt, pepper, grated cheese and mix again. 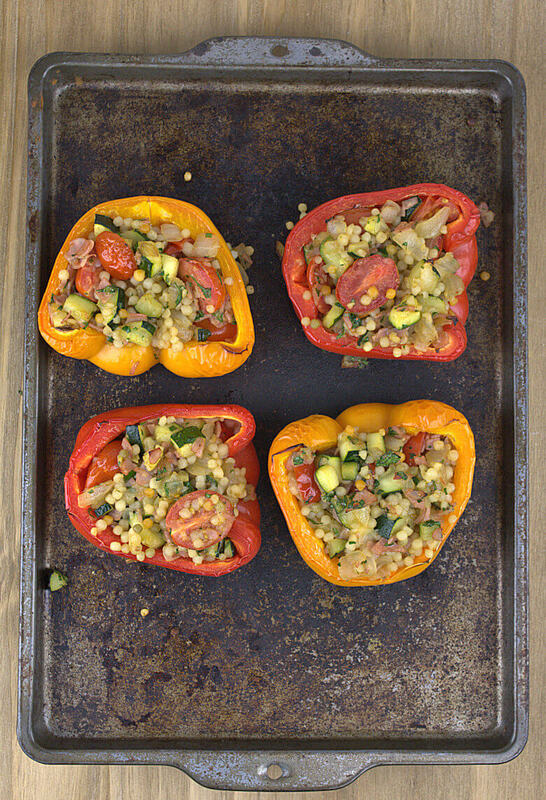 Add the couscous and chopped parsley, mix and fill the bell peppers halves with the vegetable-couscous-mix. Place baking sheet back into the oven and cook for another 5-10 minutes. Peppers will soften a little and filling will be steaming hot. 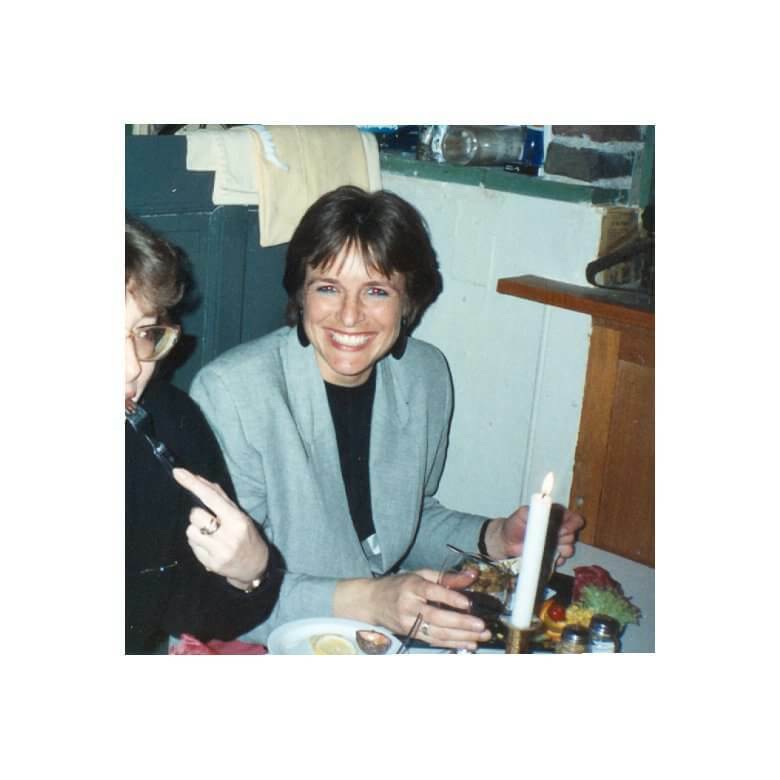 Just before the end of the cooking time, bake eggs, sunny side up. Just before serving, transfer egg on top of bell pepper halves.